"Waiting on Wednesday" is a weekly event hosted by Breaking the Spine where we feature our most anticipated upcoming releases. In Dance of the Red Death, Araby’s world is in shambles—betrayal, death, disease, and evil forces surround her. She has no one to trust. But she finds herself and discovers that she will fight for the people she loves, and for her city. Her revenge will take place at the menacing masked ball, though it could destroy her and everyone she loves…or it could turn her into a hero. 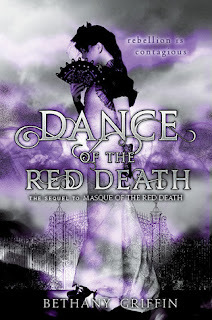 With a nod to Edgar Allan Poe, Bethany Griffin concludes her tragic and mysterious Red Death series with a heroine that young adult readers will never forget. What's your WoW pick for this week? I haven't read the first book in this series yet. I need to get on that. They have such pretty covers.